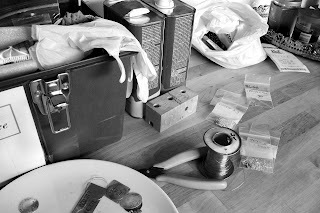 As I mentioned before, I’ve been missing my old friend – creativity. So, when she showed up I invited her in. Be careful when you invite someone in. You just never know about their manners. Will they politely come in, wipe their feet and hold up their pinkie while they sip cocoa? Will they dab cookie crumbs off their mouth with your vintage monogrammed linen napkin? They might, these old friends of yours, the ones you’ve missed so much, they just might. Mine didn’t. She flew in like a tornado and has turned my household upside down. Creativity is a welcome guest, regardless of how she arrived. I’m glad she’s back, but low and behold that girl takes up quite a bit of room. I was looking for something to get my creative juices flowing. I found it and boy are they flowing! I went to a huge trade show in Tucson and loaded up on supplies. I started this blog and I’m going to open my Etsy shop later this week. Now, can we talk about my kitchen? That’s a portion of my countertop. I design and make jewelry. Right now I’m creating it in my kitchen. Hopefully the tornado will wind down and I will be able to get some of these pieces out of my kitchen and into my new Etsy shop. I used to like my kitchen. It was a great place to cook and play cribbage (we do a lot of that around here). My kitchen is gone. It’s been kidnapped by this thing I’m calling “creativity”. Last night my husband had a banana and cereal for dinner and a free cookie at the Spelling Bee for dessert. He ate the banana in the car and the cereal on the little sofa in my office because really, I can’t cook in there right now. It looks like it was hit by a jewelry tornado. I suppose it was. He never said a word. He’s a trooper that guy. You’re going to love him. I promise. I sure do. 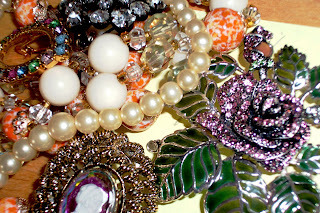 I also love vintage jewelry and will be posting some in my new shop as well. Isn’t it pretty? Isn’t it awesome? It’s unique and each piece has a story. I digress. This is not how it walked in the door. It was dirty, very, very dirty. This is how the pile looks after my loyal, devoted and very supportive mother gets hold of it and cleans it. That woman can clean anyone under the table. After that, she’ll clean the table! Then, after she cleaned the crown jewels she did this. She got it organized. The cataloging starts and it gets “staged” for the portraits. That’s the other side of my kitchen counter this morning. The tool chest photo is on the left side of my cook top and this is on the right. There is still a little room to put a glass down next to that pencil so all is not lost. No, not all is lost but the rest of the pearls that came off this vintage piece are. They are somewhere here in my former kitchen (I think). I’m not lost anymore - my old friend is here, she didn’t wipe her feet and she dropped crumbs all over my floor but I’m going to let her hang around anyway. I love this story! Good luck with your venture! Messy can be a good thing. If it's different than you, it can definitely be a good thing. And good luck. I can't wait to see all of your jewelry pieces on Etsy! Enjoyed your blog so far, looking forward to reading more. LOVE your Mum - and this is one of the reasons why!